I'm back! What do you mean you didn't notice I was gone?! I can't say I really blame you, my guest bloggers did such an amazing job in my absence I almost decided to extend my holiday. I had a fantastic break and am fully refreshed and absolutely bursting with blogs to write up for you all. But for now I have some amazing news to share. Whilst I was away I had next to no phone signal so was pretty much out of the loop. Imagine my shock when I stumbled into a free wifi zone and my phone suddenly went crazy with Twitter notifications telling me that I'd been shortlisted for a Blog North Award. 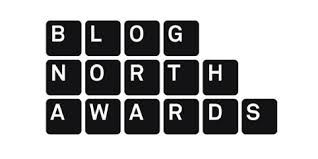 For those that don't know, the Blog North Awards is part of the Manchester Literature Festival and celebrates the best of Northern England's blogs across six categories. Hundreds of blogs enter every year so to hear that I have made the shortlist for The Best City and Neighbourhood Blog is absolutely mind blowing. I feel so overwhelmed and completely shocked that the Judges thought that New Girl was worthy of being in the shortlist of 5 blogs. Being a bit of an emotional sap, when I heard the news I confess there were a few tears. To come this far is so great but here's where I need your help. I have such an amazing amount of support from my lovely readers and if you enjoy reading my blog and hearing about the things that I get up to in my little corner of Northern England I would really appreciate your vote. The winners get announced on 8 October and awards are decided on a combination of public votes and the votes of the judging panel so I really would appreciate every vote. All you need to do is click here where you will find New Girl in Toon listed under Best City and Neighbourhood Blog. Then you just need to click against my blog and press vote. Thank you so much for all of your continued support and for making New Girl in Toon a success, I will never quite get over the fact that people other than my Mum and boyfriend read my ramblings! Voted!! Can we vote a few times? Congratulations. I've voted. Best of luck! Well done! I am a fan and have voted too!